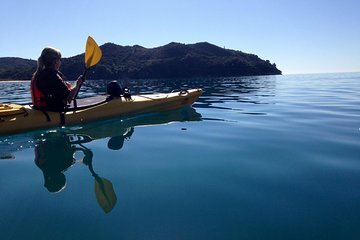 Paddle your way through the turquoise waters of the Abel Tasman National Park on this relaxing half- or full-day tour. Start with a scenic hike over the headlands (full-day tour only), then hop on a kayak for a leisurely guided tour along the coast and the Falls River. Cruise past the beaches of Bark Bay; see landmarks like Split Apple Rock and Adele Island; and enjoy a close encounter with a colony of New Zealand fur seals on Pinnacle Island. Overall a very good tour where we did some hiking and some challenging kayaking. The guide showed a lot knowledge of kayaking and the surrounding water, and we really enjoyed the beautiful scenery. Due to weather, we had to change the kayak route, and we couldn't get close to the Split Apple Rock, instead we were able to take photos on the water taxi from far away. Definitely check weather forecast before booking because it does make a difference.